Even though healthy cookies are typically whole wheat without maida, wheat also has gluten. Today many people was even gluten free and there is good demand for gluten free cookies. Our own rice is gluten free. In Persia, there is a rice cookie made from rice flour. I immediately tried it and it came out really well. Try this cookie for sure. Click HERE to view 30+ Cookies Recipe. 1. In a pan, add ¾ cup sugar and ¼ cup water. Heat the mixture till the sugar dissolves completely. Don’t oven boil and make it thick mixture. 2. Switch off the flame, add rose essence and allow it to cool down. Keep it aside. 3. In a wide bowl, add butter and beat the butter till it reach fluffy using the whisk or electric beater. 4. Add rice flour, oil and cardamom powder or essence with butter mixture. Mix them well. 5. Add sugar syrup (from 2) with this rice flour-butter mixture. Then knead them into a soft and pliable dough. 6. Wrap the dough with plastic sheet and keep it in the refrigerator for 30 mins. 7. After 30 mins, roll the dough into ¼ inch thickness sheet using the rolling pin. (Dust the rolling surface with rice flour). 8. 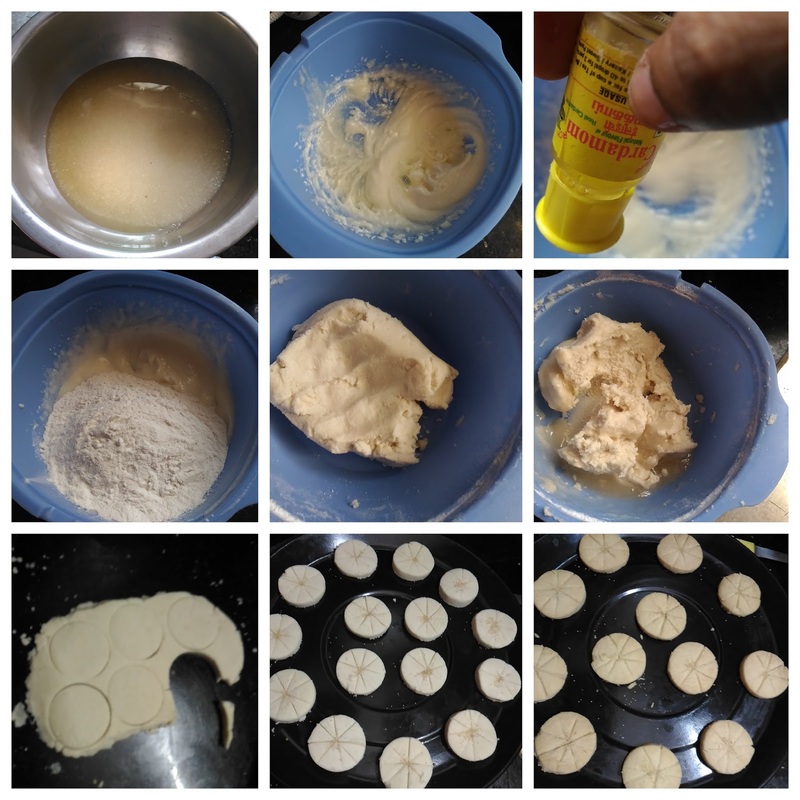 Cut the sheet with round cookie cutter or bottle cap (2 inch diameter). 9. Make flower patter using the knife (see the picture) or just press with fork. 10. Place a pinch of poppy seeds at the center of the cookie and press them gently. 11. Arrange the cookies on the ungreased baking tray. Leave ½ inch gap between them. 12. Preheat the oven for 200 degree Celsius. 13. Bake the cookies for 13 mins at 140 degree Celsius. 14. Allow them to cool down completely on the tray itself. 15. Then take them out from the tray and serve. Really yummy, delicious and gluten free cookies are ready! 1. You can use either homemade rice flour (Recipe HERE) or store bought rice flour.